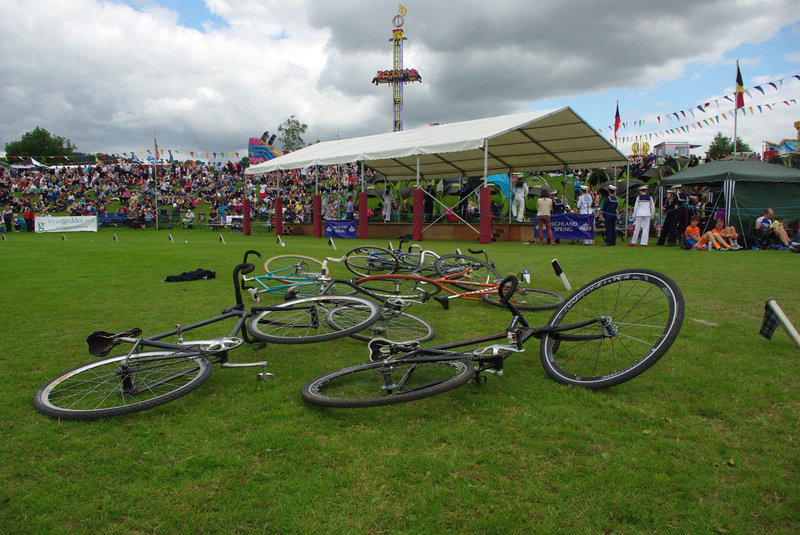 Fixed gear at the fairgrounds. dandyhorse magazine publisher Tammy Thorne recently visited Scotland. While there, she discovered that the bicycle is an important part of the country’s rich history and current culture. 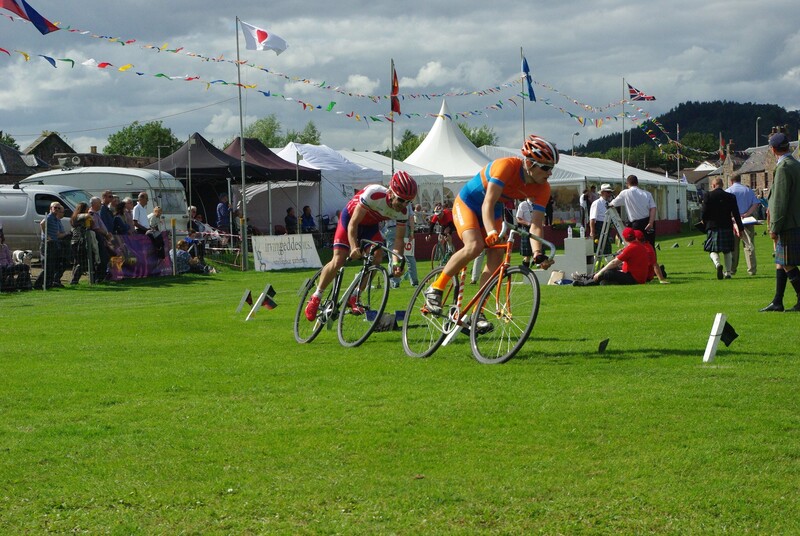 Not only is Scotland birthplace of the modern bicycle, it hosts hundreds of bike events each year, such as the grasstrack race featured in this story. This is the first in a short series documenting Tammy's strolls and rolls in the land of bagpipes and bikes. When I first arrived in Scotland, I met my friends who live in Crieff, in the centre of Perthshire — in the heart of Scotland a.k.a. Strathearn. They informed me that the Crieff Highland Gathering was taking place on my first weekend there and would feature a cycling race on a grass track. Exciting! 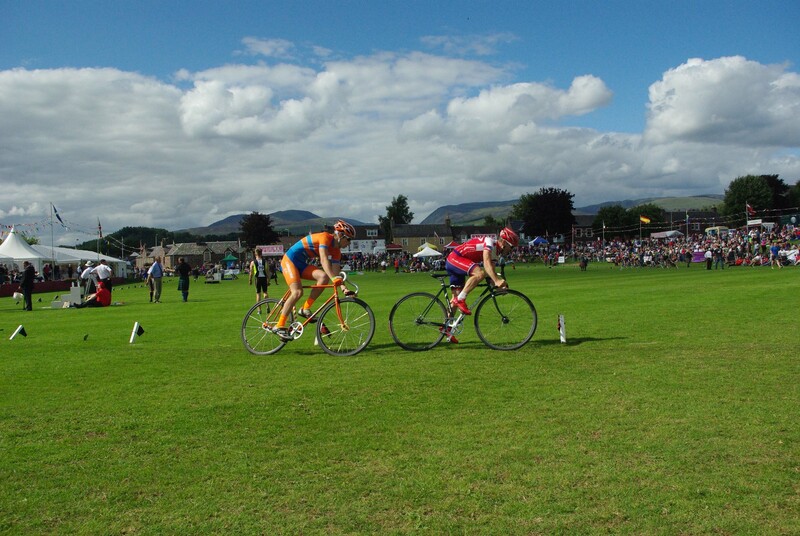 I'd never seen a bicycle race on grass before. 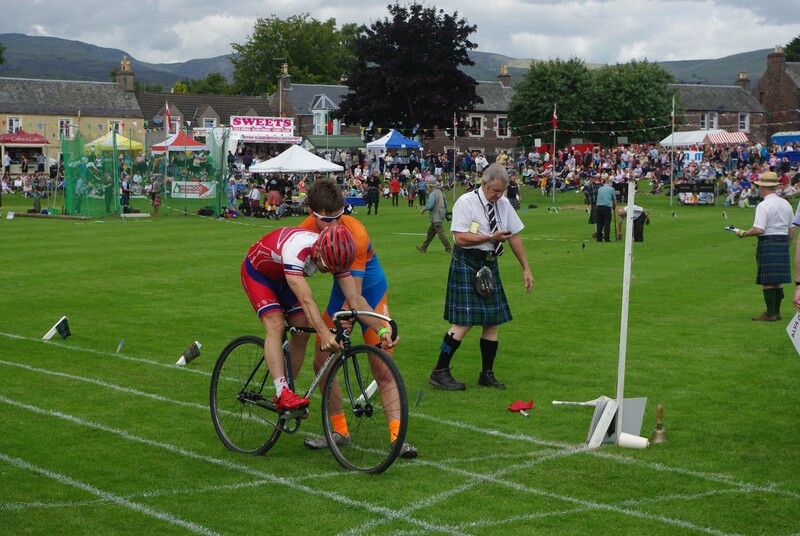 Cyclists get a push-off on the starting bell on the grass track at the Crieff Highland Gathering. 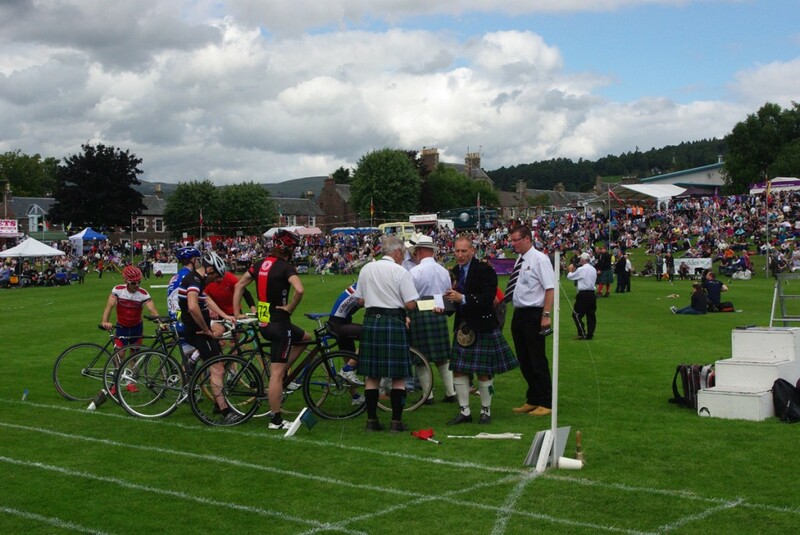 As it turns out, cycling competitions have been part of the Highland games for hundreds of years. 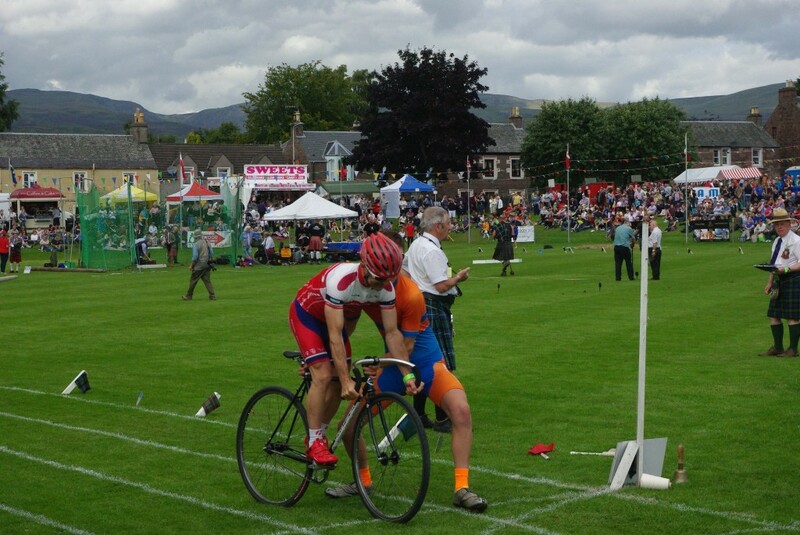 Cycling in Scotland is very popular, and the country —with a population less than a quarter than that of Canada— has over 100 amateur cycling clubs, three velodromes and a few famous cyclists to brag of. Among the famous cyclists is Sir Chris Hoy, who the velodrome in Glasgow is named after. 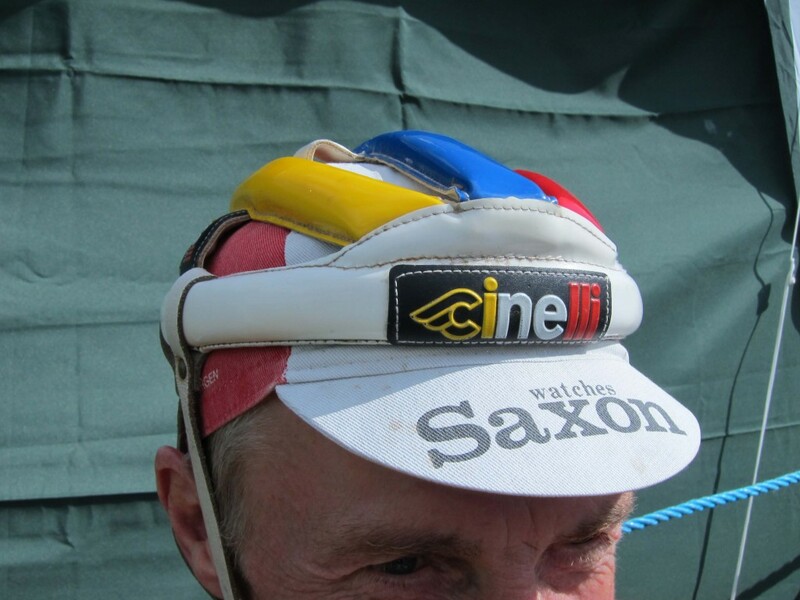 He won many Olympic medals and placed forth in the Tour de France in 1984. 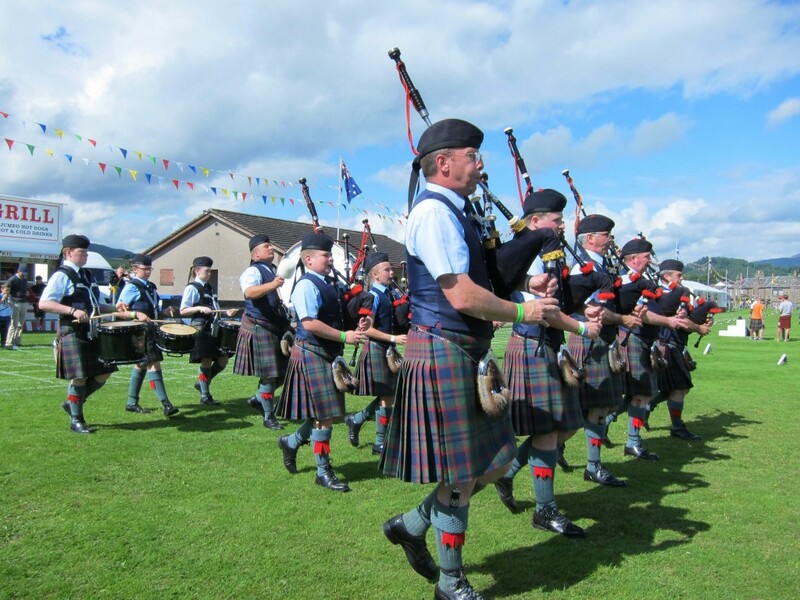 Although officials apologized to me that their highland games this year had fewer pipe bands (since it coincided with the International Piping Competition in Glasgow), the Crieff Highland Gathering did not disappoint. Indeed these games were founded in 1870, which makes Crieff's highland gathering one of the longest running and most traditional. 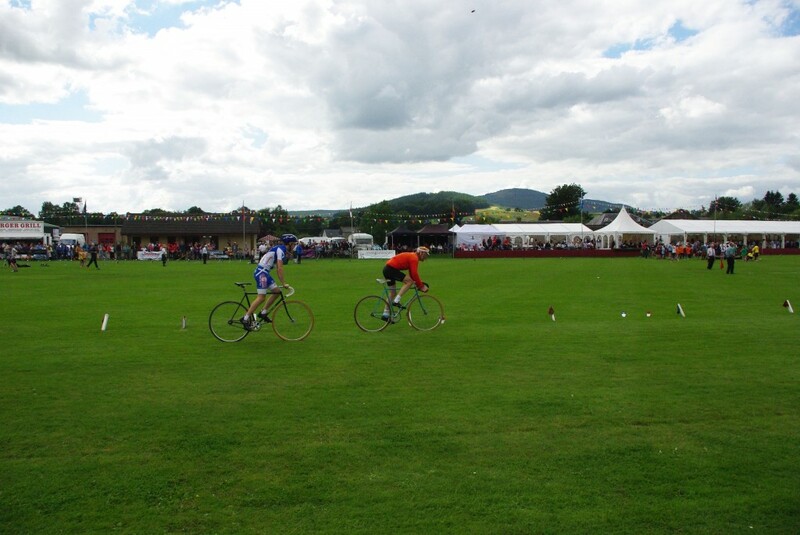 Caber and mace tossing in the centre field was framed by events like the tug-of-war, highland dancing and, the grasstrack bike race. 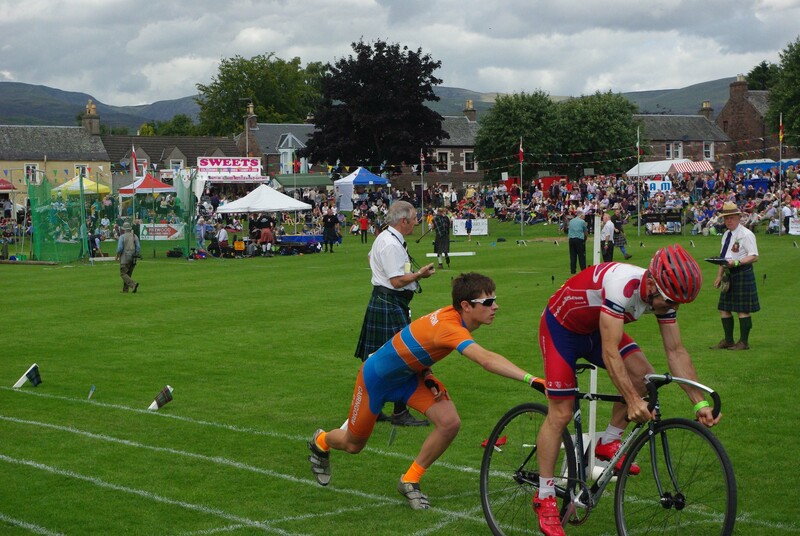 Besides a dozen or so pipe bands, the town's Highland Gathering also includes classic track and field events, biking, running and long-jumping — plus live music, lots of games for the public and rides for children. Two years ago, the gathering welcomed Ewen McGregor as Chieftan of the games. The actor's parents live in Crieff where he grew up and played side drum in the local pipe band as a youngster. Here's a wee video from "Tartan TV" of Ewen at the Crieff Highland Games from 2001. Craig Hardie, from Dalgety Bay, had the privilege of getting his push-off from the movie star. 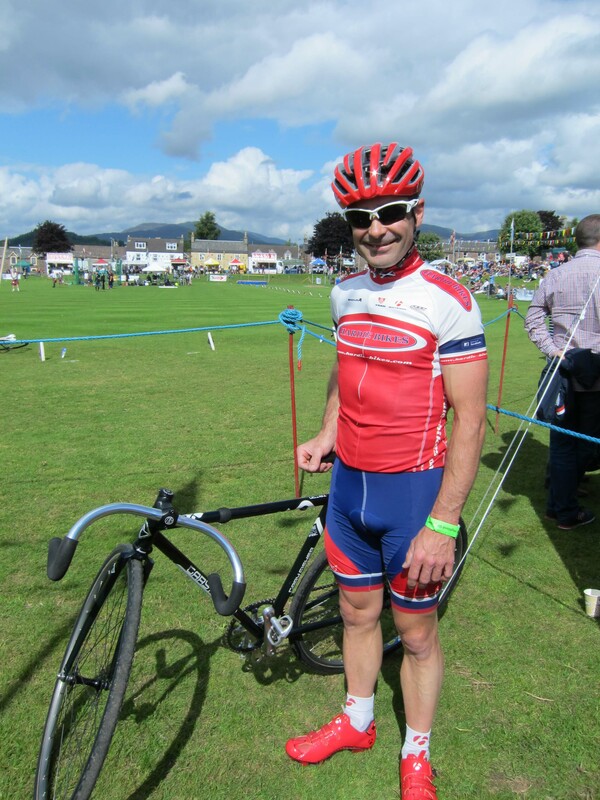 Craig blogged about it and told me that Ewen was a "top bloke" who did really like his bikes. 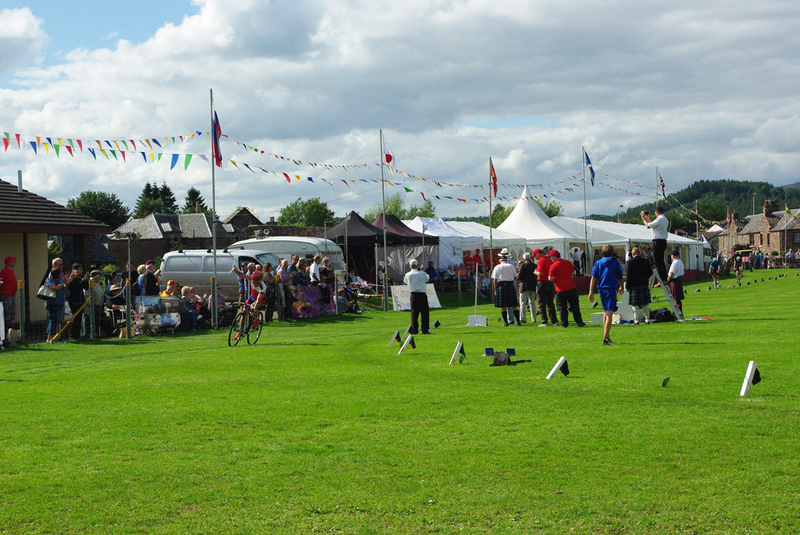 Craig Hardie at the 2015 Crieff Highland Gathering. Hardie is a bit of a local bike hero —he's won most of the cycling competitions in the Kingdom of Fife, a nearby county on this side of the great Forth bridges over the firth of Forth. There, he has a bike shop; Hardie Bikes. I also met Dave Matheson and Ryan Keir, the oldest and youngest competitors in the bike competition—both from Newburgh. 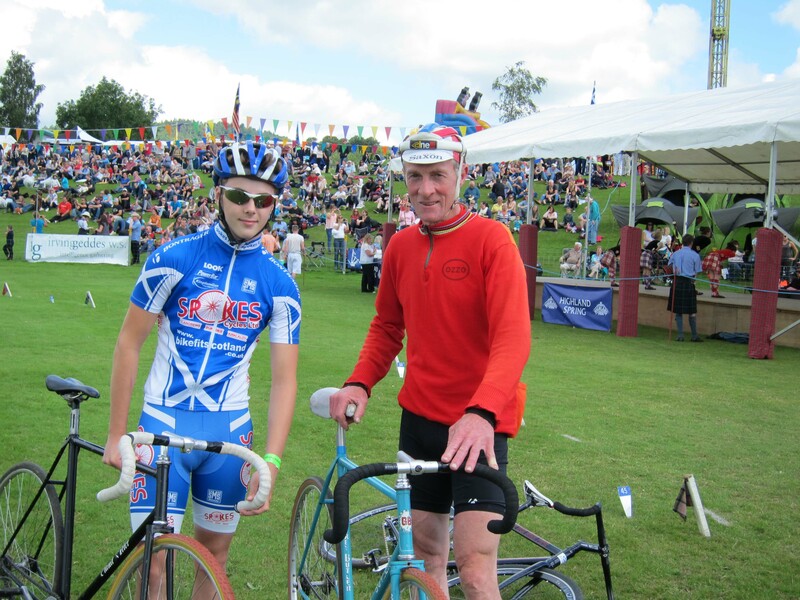 Dave said he's been to hundreds, maybe thousands of Highland games bike races, and this was Ryan's first grasstrack race. Because Ryan was quite young and inexperienced, and Dave quite old and presumably a bit slower, the complicated handicap system allowed for them to start at the front of the pack. 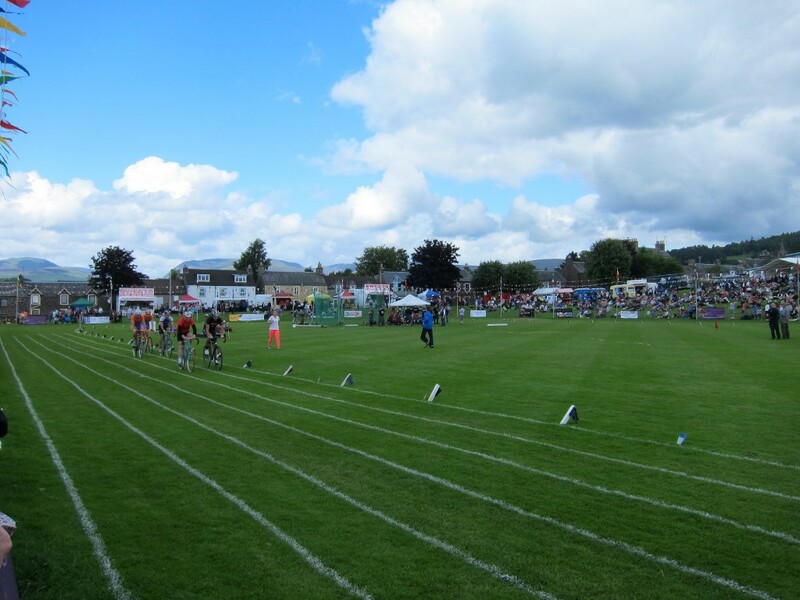 Dave finished fourth in the starting 800 metre race and Ryan finished third in the 1600 metre race following, but it was local pro Craig Hardie (who had to start at the back) who won the 3200 metre race. He also won the grand finale event: "Deil tak the hindmost." In this race, whoever is at the back of the pack at the end of each lap is automatically out. "Deil tak the hindmost" means the devil takes the last one, and comes from the Burns poem To a Haggis. Gotta love Scottish vernacular! The riders are not staggered in this race which usually culminates in the aforementioned “hindmost” showdown. 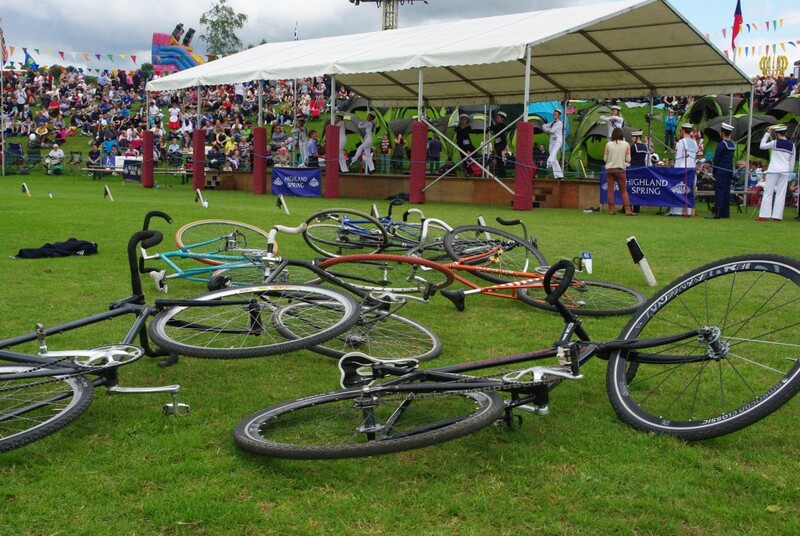 It's a frantic multi-lap sprint as the last rider across the line in each lap is withdrawn. It was Dave who was out after the first lap. He was a good sport, cheerily pointing to himself as he crossed the finish line for the final (also, first) time in the "hindmost" race. Dave was totally old school, sporting a hairnet (the helmet-like accessory pictured above) and he doesn't ride clipped in. Because the grass makes it harder to pedal and to reach a high speed, the riders use lightly knobby tires and lower tire pressure. 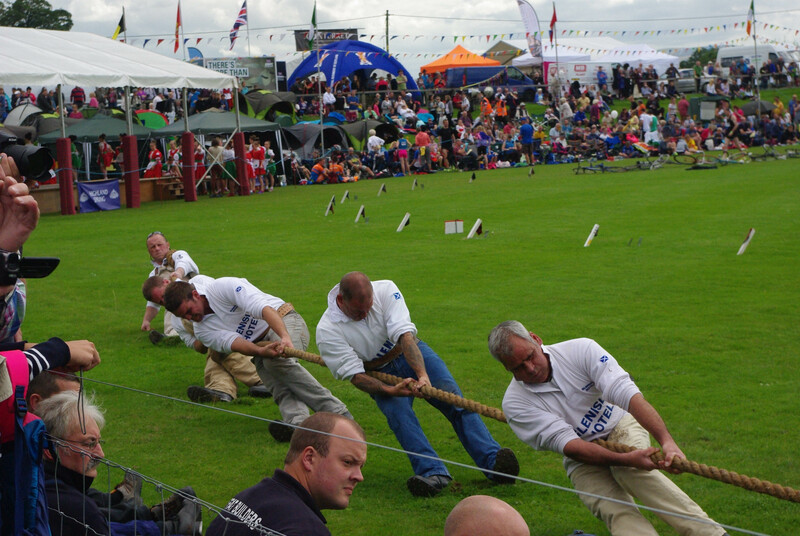 They also get the old heave-ho — a big push-off at the start of the race. Craig Hardie gets a push-off. It was an absolutely fantastic day with sunny skies. Craig celebrates crossing the finish line as the crowd cheers during his "Deil takes the hindmost" victory. Riders wait to see which top three get paid. First place wins 50 pounds. Overall, the games were great and certainly the highlight of my trip. 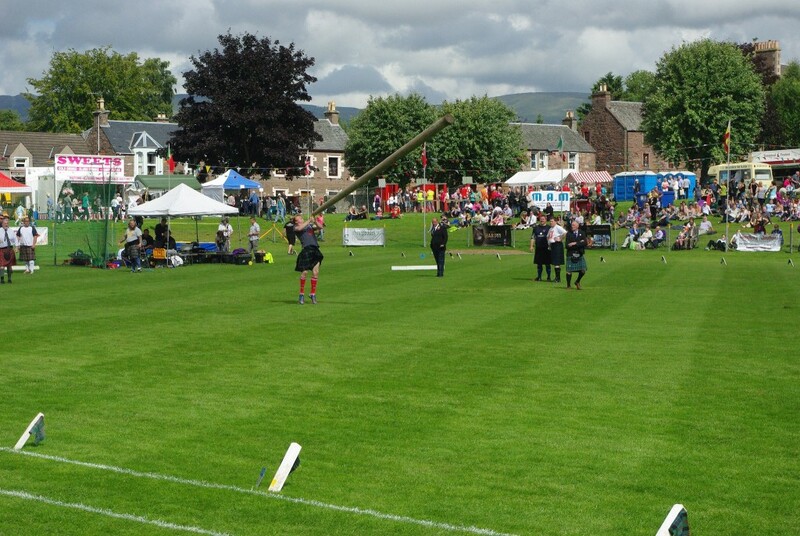 I did not expect there to be so many medieval games: caber tossing by "heavyweights" where a giant telephone pole-like log was thrown, and tug of war, with teams of local labourers, were both awesome events to behold. 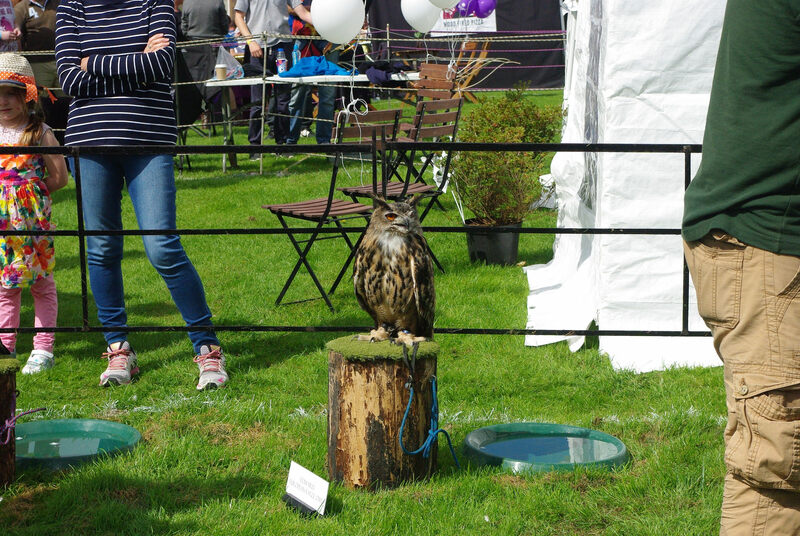 There was also an archery booth for kids, and birds of prey to pose with. 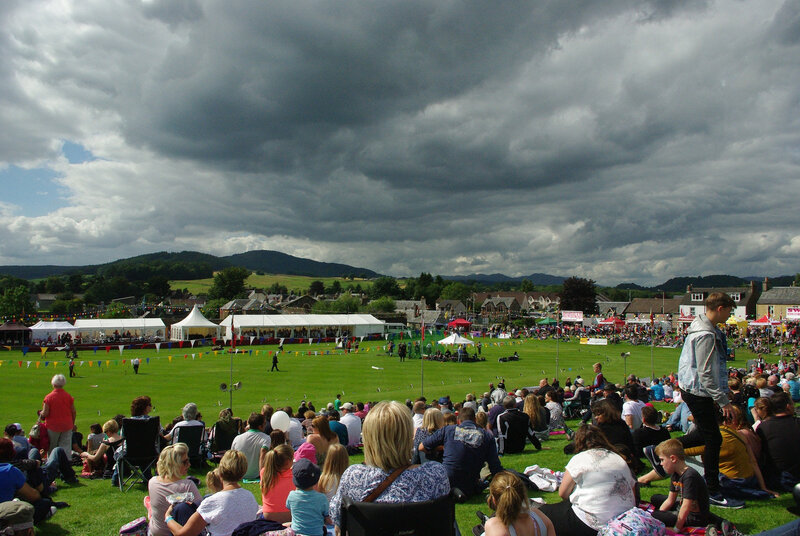 Thousands of viewers sat on their tartan blankets on the gently sloped hills in the sunshine to enjoy a perfect day. The park where the event is held, called Market Park, was once slated to become a big box grocery store, but locals fought against it and won. Hungry spectators enjoyed delicious snacks like venison burgers or curry chips and a tin of lager. Parents took kiddies on the inflatable waterslide or drop-zone ride followed by a treat of of some "sweeties." All-day piping was the backdrop. 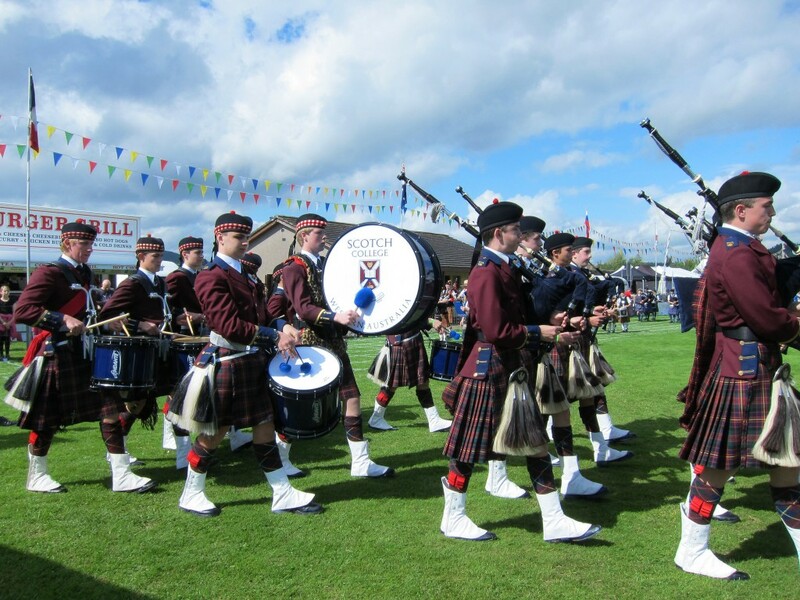 It was exactly what you would expect at a traditional highland gathering—and more! All told there were more than 6,000 people who enjoyed the games this year. 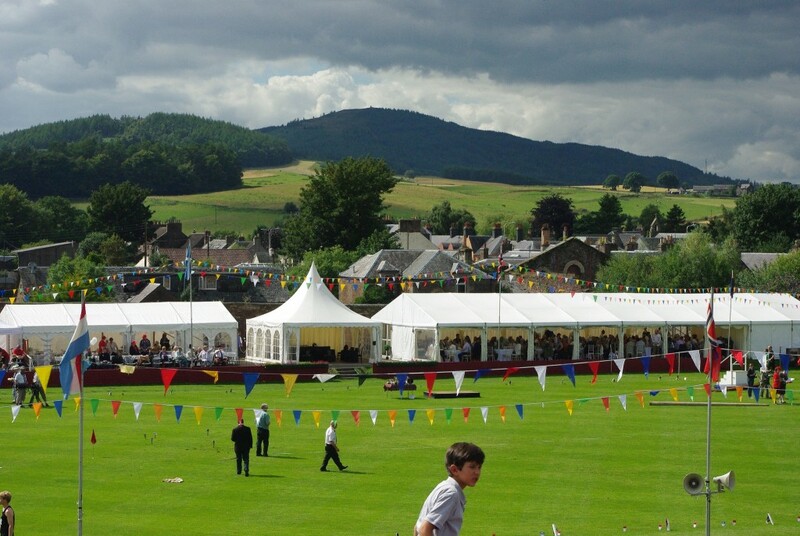 Way to go Crieff Highland Gathering! A true craic! Gorgeous weather. Good food. Great entertainment. People came from all over the world, like me, and from across Scotland to enjoy these games. The grasstrack race was a new and exciting experience for me in itself, but the fact that it was part of one of the most traditional Scottish Highland Gatherings made it even more special, and definitely the highlight of the games for me. After all that bike race action, I had to get some biking in myself. See photos from my ride on Lady Mary's Walk and over to the Famous Grouse distillery here.